This isn’t a battle between cakes, it’s a battle between the creams! 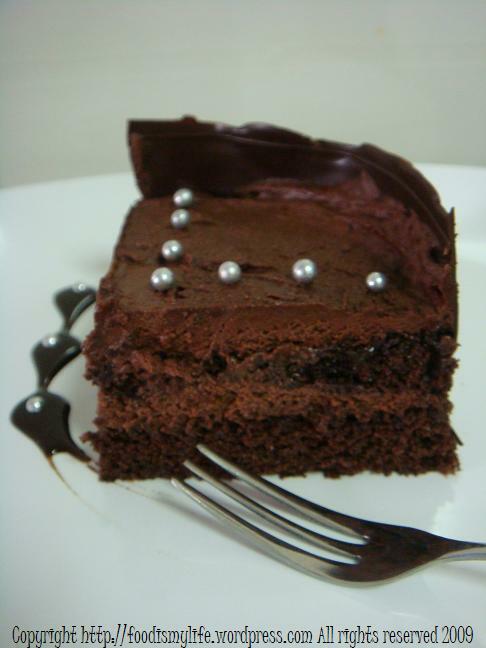 After watching a video on how to make a chocolate genoise, I knew I have to bake this cake. I’ve not yet made a successful sponge cake before – either it didn’t rise enough, or it turned out rubbery, or rose too much and then sank all the way to the bottom… Yeah, it’s chaos when it comes to sponge cake – I’m seriously terrible at making one. But hey, I can’t just sit by and stop trying. So I research, research and research, until I chanced upon this video through Tartelette (which is an amazing site by the way). Watching the video really boosted my confidence to give it a try. Result? The cake did rose to a very pretty good height then sank a little (which is supposed to, according to the video) – but unfortunately for me, while it sinks, the sides of the cake sure didn’t want to sink as well. The sides of the cake stubbornly remained intact to the sides of the cake pan and I regretted my choice not greasing the cake pan. I know I know I know, how can I not grease the cake pan? Well, I chose to heed the instruction of the video which said, “no butter no flour”. Thankfully, the chocolate collar made up for it and shielded the ragged sides away from everyone. Oh but I’m surely going to make the genoise again – the next time I’m so going to grease my cake pan – the cake turned out really light. A little eggy but the lightness that I wanted is there, right in the genoise. The cake is a little disastrous, but the cream is the other way round – fabulous. 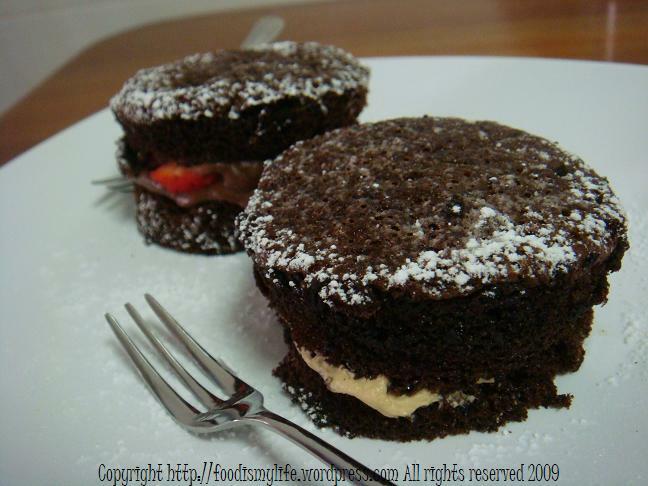 I’ve always wanted to try sandwiching genoise cake with chocolate cream or coffee cream. Hence why waste this chance? Instead of making one 8-inch cake, I made two smaller cakes (5.5 inch in diameter each) and sandwich each with chocolate cream and coffee cream respectively. I followed the instructions in the video to mix melted chocolate with whipped cream – the filling is smooth and light. Instead of using dark chocolate, I chose to use a semi-dark chocolate which gives off a less sweet but still chocolatey flavour. I’m sure it’s also possible to use a mixture of semi-sweet chocolate and dark chocolate. Personal choice, I guess. As for the coffee cream, I have no idea how to make it, so I just pour in some cooled coffee into the whipped cream. Taking note of the fact that coffee, unlike chocolate, won’t harden when it’s cool, I whipped the cream so that it holds slightly stiffer peaks before mixing the coffee and icing sugar in. The resulting cream is really smooth and can be spread very easily. But I will want it to set a little bit more, probably I’ll try adding gelatin or whip the cream further the next time. From the batter, besides making 2 5.5-inch cakes, I also made 2 mini cakes, which I used the leftover batter to fill 2 small ramekins. Using the smaller cake, I try sandwiching chopped strawberries into the chocolate cake, but the taste didn’t turn out very well. I wonder if it’s the strawberries that release juices which caused the dilution of the chocolate cream… Well I don’t really have a clue… >.< Without the strawberries, the chocolate cake is really good, and so is the coffee cake (though ultimately I prefer the coffee cake more =P). These cakes are really keepers and I’m definitely going to make them again in the future! Sift the flour and cocoa together 3 times. Set aside. Sift in half the flour mixture and fold gently in to the batter, then fold in the rest of the flour mixture. Next, fold a little batter into the melted, hot butter until mixed then fold it back to the batter. Let the cakes cool completely before unmoulding them and splitting them. While the cakes are baking, make the syrup by combining the sugar and water in a saucepan and bring to a boil. Boil for 2 minutes until slightly reduced. Remove from heat and let cool completely. Divide into 2 bowls. Stir the rum into one bowl and the vanilla extract into another. Melt the chocolate over a double boiler, set aside to let it cool slightly. Dissolve the coffee with a little bit of hot water and let it cool to room temperature. Whip the cream until it holds soft peaks. Fold half of the cream into the melted chocolate. Whip remaining cream with the icing sugar until slightly stiffer then fold in the coffee. Split the cakes into half horizontally. Take one half, brush the top generously with rum syrup then spread the chocolate cream on top. Brush one side of the other half with rum syrup and sandwich the cake, syrup-side down. Brush the top generously with rum syrup. Refrigerate the cake. 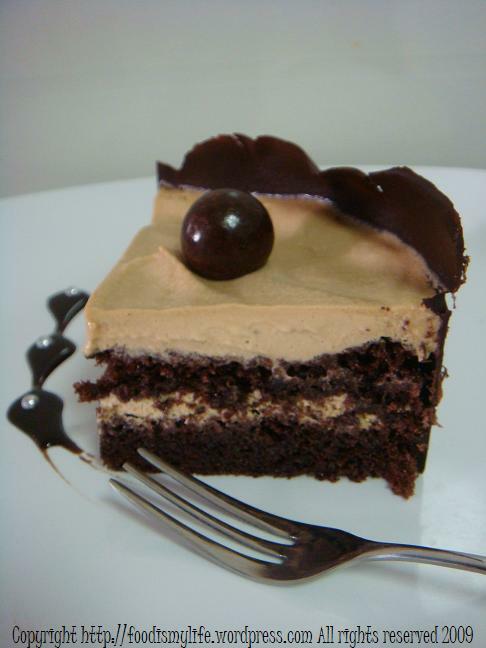 Repeat for another cake, using vanilla syrup and coffee cream. Make the chocolate collar by first cutting 2 strips of parchment paper of sufficient length and height to surround the cake. It is okay if the parchement paper is taller than the cake itself. Wipe the table with a wet cloth, then lined clingfilm (aka plastic wrap) on top of it, so as to make the clingfilm stay. Place the parchement paper on top. Melt the chocolate and pour the chocolate over the collar. 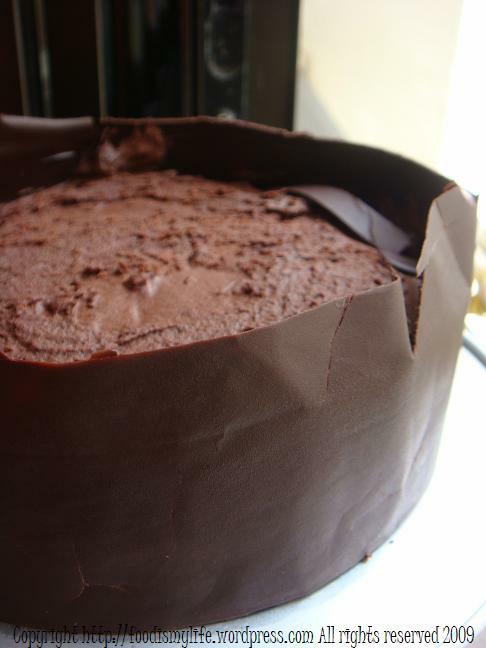 Spread the chocolate evenly on the parchment paper, making sure that it covers the parchement completely. Pour the remaining melted chocolate into a plastic bag. Let rest for 5 to 8 minutes. Now it’s time to get your hands dirty! Take the cakes out from the refridgerator. Take the plastic bag, snip off one of the corners and pipe a thin stream of melted chocolate onto the chocolate collar, as if you are applying glue onto paper. 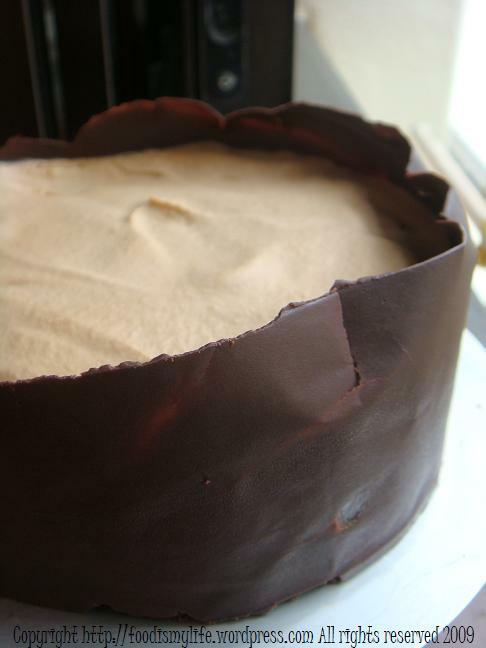 Lift the parchment paper and “glue” it to the cake, pressing the sides as close to the cake as possible. Let stand for 5 to 10 minutes. Slowly peel off the parchment and if cracks formed (like mine), use the melted chocolate to “glue” the cracks together. Keep the cake refrigeated until ready to serve. Cut the cake using a knife dipped into hot water, cleaning the knife after each cut. Serve with berries or dusted with icing sugar. Oh… chocolate… or coffee? Maybe mocha next time!